From natural slate to concrete, clay to artificial solar tiles, there are so many different types of roof tiles available to adorn the roof of your London home or office. Water may be leaking into the roof space owing to a cracked or missing roof tile and this if left unchecked, can lead to very expensive repair bills in the future. Water has a nasty habit of ruining entire properties if left over a protracted period of time. T. J. Copping Ltd Roofing Specialists are just a phone call away and can nearly always resolve whatever roofing issue you have with a simple roof repair. Sometimes, a repair is not possible and this may simply be because the roofing materials are just past their useful life, or the roof was not fitted correctly in the first place. T. J. Copping Ltd Roofing Specialists will investigate what the issue is and report back to you. Should a repair be required, then this is what we will suggest, if new roofing materials are needed we will let you know. We rely on customer referrals for our business, so we never suggest a roof replacement when a simple repair would solve the situation. Rest assured that we are more than capable of retiling your roof no matter what design, style, size or type of tile. We have been called to many jobs in and around London where large parts of a building have extensive damage due to water ingress. This amount of damage is quite often avoidable, as the reason behing it was a solitary cracked or missing roof tile. So at the first sign of a damp patch, always call in a roofing professional to determine the root cause of such a problem, it could save you many thousands of pounds further down the line. If just one slipped, cracked or missing roof tile has the potential to cause so much damage, imagine the problems that could be caused should several tiles be missing! This is usually the case following a particularly severe storm, where tiles have been dislodged by very high winds. A series of missing tiles can undermine the overall integrity of the rest of the surrounding tiles and lead to serious slippage. In the worst case scenario, an entire roof of tiles can slip from a roof, causing irreparable damage to nearby guttering. Just a quick call to a professional rrofing specialist can mean all the difference between a minor repair bill or a bill for many thousands of pounds. We cannot stress how important it is to act quickly as soon as you notice a damp patch or a missing tile. 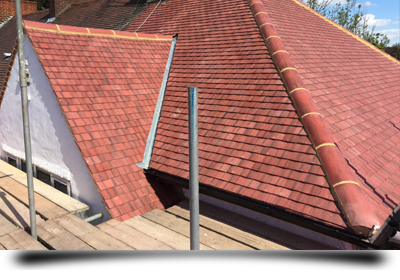 A single missing tile can lead to damage to the underlying roofing felt and in the case of high winds, a missing tile will allow the wind to get under and lift any neighbouring tiles with ease. If the repair is very straightforward and the damage minimal, it may be within the abilities of a competent DIY enthusiast. As long as you have the correct tools to complete the task at hand and are not going to put yourself at any undue risk by clambering up onto a high roof, you may be able to tackle the job yourself. However, trickier or bigger jobs really are best being left to a competent roofing professional. All too often we have seen people paying out a great deal of money when remediation work by a professional is needed after a botched attempt at a DIY job, so you are better off employing a professional roofer in the first place. Although cleaning out gutters on low roofs is possibly within the capabilities of a competent DIY enthusiast, anything more involved with roofing repairs is nearly always best left to roofing professionals.